The game of golf is played with a golf ball and a set of golf clubs. Several types of clubs are used to play a golf course, depending on distance and situational requirements. 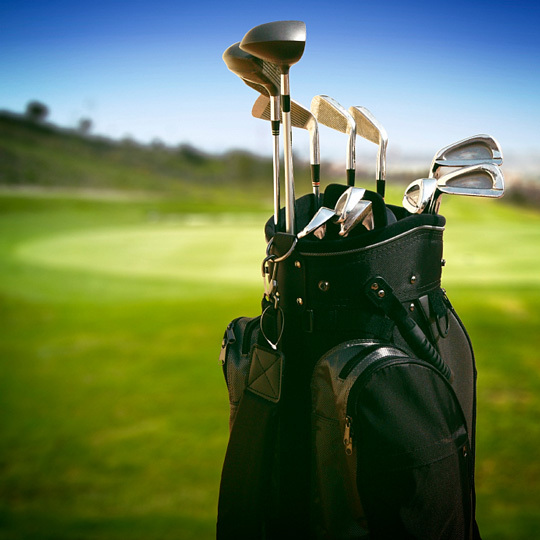 A player may use no more than 14 different golf clubs during a golf tournament. Early golf clubs were made from wood, but stronger golf club materials and improved designs emerged as harder golf balls were developed. Today's golf club heads and shafts are made from a combination of steel, graphite, titanium, and various alloys. As golf players continually seek an extra performance edge, golf club designers continue to develop clubs that claim improved stroke accuracy and flight distance. Competition among golf club manufacturers is intense and has resulted in good quality golf clubs becoming widely available at reasonable prices. A set of golf clubs consists of woods and irons with varying shaft lengths and clubface angles, plus a putter. A golf club's shaft length and clubface angle affects the distance and height of the golf ball's flight trajectory. In order to deal with the range of situations encountered on the golf course, most players have eight to ten irons, three to five woods, and a putter. Woods are designed for long-distance strokes. The 1-wood is called a driver and is normally used for tee shots. All other woods are used on the golf course fairway. Irons are designed for approaches to the green. Special types of irons, called wedges, are designed to hit the ball high and short, and are used for a variety of special situations near the putting green. Putters are designed to roll the golf ball, and are most often used on the putting green. The straight, full clubface of a putter helps to aim putting shots accurately. Golf-Balls.org features two leading golf club manufacturers, Pinemeadow Golf and GigaGolf, which sell their golf clubs online. 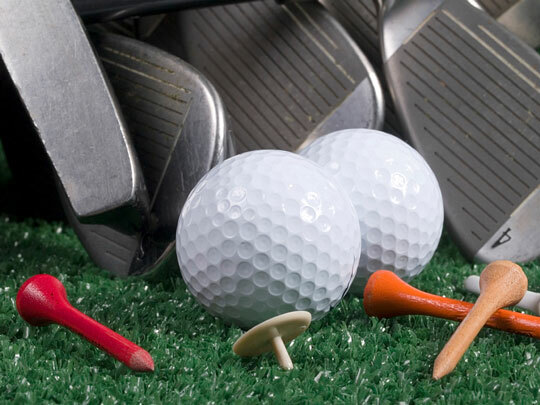 We also list a selection of popular pro shops and golf equipment manufacturers that sell new and used golf clubs, golf balls, components and accessories at competitive prices. This golf equipment company has built clubs for thousands of players worldwide during the last 15 years. They strive to stay up to date with current golf technologies, offering their golf clubs at attractive prices. This company sells their custom clubs direct, which can save customers money versus buying more expensive "off the rack" clubs from retail middlemen. Website visitors will find that GigaGolf uses high quality components. Their standard shafts and grips compare favorably with industry standards. Their GigaGolf eFit system, along with their exclusive Shaft Fitting Wizard, is designed to guide buyers through the online purchasing process. This firm offers certified used golf clubs. Some golfers prefer to exchange their old golf clubs and trade up to Certified Preowned Callaway Golf Clubs rather than buy new golf clubs. Maker of the original Big Bertha Driver and premium golf clubs for tournament and recreational golfers. Specializing in the wedge, Cleveland also offers woods, irons, putters and clubs for lefties, women and juniors. Leading manufacturer of golf putters helps you face the putting challenge with gusto. Hillerich & Bradsby began making golf clubs in 1916. Today, this firm offers premium PowerBilt® drivers and fairway woods. 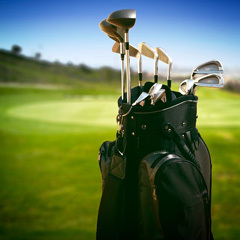 Features an extensive line of golf clubs, golf bags and golf balls. Leading manufacturer of golf drivers has been an innovative technological pioneer since being founded in 1979. Serving the needs of serious and recreational golfers with quality golf products. This sports equipment manufacturer offers a broad selection of drivers & utilities, irons & wedges, putters, golf balls and accessories. Features a full range of golf equipment ranging from award-winning irons to golf bags and accessories. A fascinating article about developments in nanotechnology and their impact on sporting goods products, specifically golf balls. Learn about the game of golf and how it is played. This golf cart supplier directory lists golf cart suppliers throughout the USA. This golf products directory lists golf equipment and supplies retailers throughout the USA. Golf-Balls.org. All rights reserved. About us.